When the doors of this powder 'room' are closed, I'm sure it's a very cozy situation—but nonetheless, I'm impressed with both the concept and execution of the design. Installing a wall-hung toilet saves nearly a foot of floor area, and horizontal tiling on the wall orients the space effectively. Nicely done. It's so well done that it's fascinating just to wonder about. 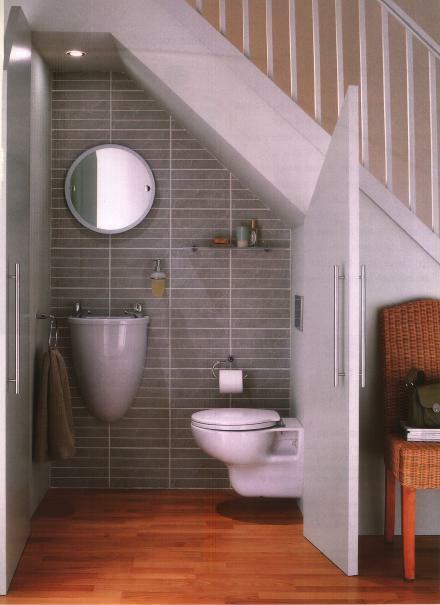 The toilet is curvy enough that it blends with the furniture, while still being contemporary. Perfect choice. The mirror seems like it might have once been the lid to the sink, or the half they kept. I like the brown towel against the gray tiles, and I especially like that they resisted the urge to tile the floor. But, what I keep wondering about is the two doors with no latch. You'd need a system for that, or am I missing something? An important detail, this, Evan Jones. I have two theories. One: PhotoShop. Two: A ball catch mounted on the top edges of the doors. If the latter is the case, you would still see a hardware element, albeit a small one, on the 'ceiling', but it would be obvious enough to any one retouching [quaint word, yes?] the photo to remove it. Regrettable that in the pursuit of a smoooooth visual experience that the telling details of reality are so systematically obliterated. As always, your observations are keen. Thank you for reading and writing. And looking. This is interesting, however; I wonder if the angled sloped ceiling above the wc poses a challenge for a tall man standing and er...attending to his business at the wc. Foreheads may be bruised if one looks down or bends forward to flush. You're right, Laurie—one would certainly need to take care re head clearance. Perhaps this has been designated a kids-only space?